Please enjoy this scripture photo I made of the machinery of prayer. Under that will be some further resources on prayer suggestions. Monday I suggested praying for the persecuted and missionaries around the world, with some resources to check out along those lines. Tuesday I suggested praying for our elders (pastors, deacons, teachers, etc), again, with resources. Wednesday I suggested praying for each other. Today focuses on how often to pray. Thursday I offered information about frequency of prayer. Today let's focus on Jesus in heaven who hears our prayers, and what a comfort that is. 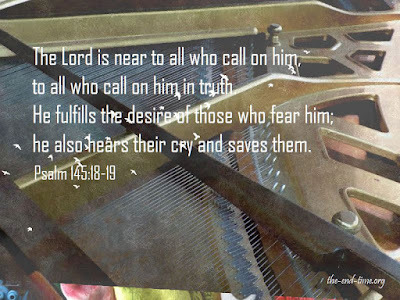 he also will hear their cry, and will save them; that is, he will hear and answer their prayer, which they put up to him in their distress: they cry to him either mentally or vocally, in their troubles, and his ears are open to their cries, and they enter into them; and he regards them, and saves them out of them; out of their temporal and out of their spiritual troubles; he saves them with a temporal and with an eternal salvation. We have such a good God who hears. Our fear and devotion to Him, and His careful attention and love toward us, makes a wonderful relationship. And that is what our religion is, not formalist with rituals and rules, but a relationship with a Holy God who cares.